Spectral has made a name for itself over many years with innovative solutions such as integrated sound systems, hidden cable guides and projector drawers. Today we are regarded as pioneers for the combination of beautiful living and entertaining technology. Whereas information technology, consumer electronics and telecommunications were areas that were independent of each other only a few years ago, today they are - thanks to smartphones - no longer separate: you write e-mails, surf the Internet, watch films, take photos, listen to music, send messages and on the phone - all with one device. But as smart as the new phones and tablets are, they have one major drawback: while we are content with the limited image size and sound quality of mobile devices, we are much more demanding at home. From our couch we want to enjoy music in full quality and volume, play photos as a slideshow on the TV and stream movies from the net or from the cloud in HD to the TV. Spectral's mission is to integrate this digital world into an attractive living environment. Analogous to smartphones and smart TVs, we are developing smart furniture - elegant home furniture with intelligent additional functions. Spectral Audio Möbel GmbH was founded in 1994 by the three brothers Frank, Heiko and Markus Krämer. After several failed projects, such as the development of halogen lamps, motorized skateboards and loudspeakers made of Plexiglas, the three students and passionate inventors had decided to produce hi-fi racks. A wise decision, as it soon turned out. Birthplace of the first Krämer furniture was the home garage of the father. KONKAV was the first production-ready Spectral rack to be built here, which incidentally was on the program until 2010. After the first sales successes and the expansion of the model range followed in 1999 the construction of the first hall with production and administration in the Swabian Bietigheim. The foundation for further growth was laid. Already in 2003, the three Krämer brothers counted about 60 employees to their team, further additions followed. In 2006, an additional production and logistics facility was added to Plant 2 in Pleidelsheim a few kilometers away. In the same year, further product innovations and trend-setting changes in marketing and sales followed, driving Spectral forward on its way to becoming Germany's number one. As more and more furniture manufacturers moved their production to the Far East, Spectral remained true to its line. With a new factory in Pleidelsheim near Stuttgart in 2010, the company made a clear commitment to the production location Germany. A decision from which not only the employees but also the customers benefit thanks to the highest quality standards. Today Spectral is one of the most successful A / V furniture specialists in Europe, is market leader in the premium segment, has 150 employees and exports worldwide. The founders of the company see the secret of their success in two slogans that their father has given them: "Do not talk, do not talk" and "Do it as easy as you can." Alloi complicates it. " (Make it as easy as possible, it gets complicated on its own). In other words: Swabian diligence and a highly functional design - virtues that are still at the top of the list at Spectral. Spectral Audio Möbel GmbH has a worldwide distributor network. At Spectral, our goal is to combine the best in entertainment and beautiful living. 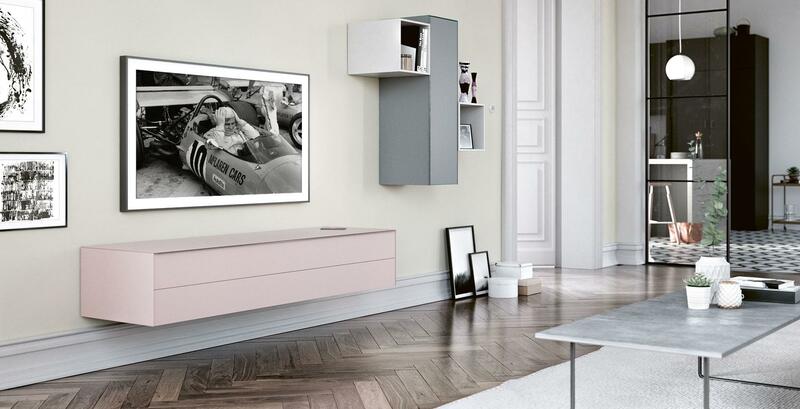 Under the motto "Smart furniture", we develop and produce high-quality multimedia furniture with unique solutions that invisibly integrate sound systems, cables and mobile devices. Spectral is the most successful multimedia specialist in Europe. The company is located north of Stuttgart, employs more than 150 people and exports high quality media furniture worldwide.